Obviously, “the healthiest smoothie ever” is subjective and will vary from person to person depending on your physiology and bio-individuality. But, if you make this smoothie with at least half of the ingredients it calls for, there’s a good chance it will rank near the top of your all-time healthiest smoothies list – maybe even number one. Superfoods are a quick and easy way to really boost the nutrition of your smoothies. I consider a food super if it contains high amounts of several different vitamins or minerals and confers a half dozen or more health benefits. Take goji berries for example. As you can imagine, combining several or more superfoods into one smoothie results in some serious nutrition. 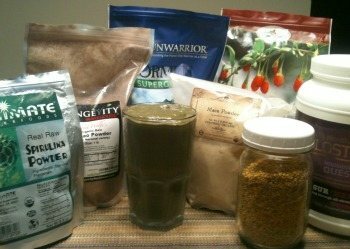 One thing I’ve yet to encounter when mixing and matching the various superfoods, a smoothie that doesn’t taste great. Superfoods really do compliment each other nicely. Oh yeah, I did have the best day ever after guzzling this smoothie down for breakfast. Enjoy! Load all these wonderful superfoods into your high speed blender and blend for around 30-45 seconds or until your desired consistency is reached. If you don’t have a very powerful blender and your coconut oil is in liquid form, you might want to blend everything except the coconut oil first, then drizzle it on and blend for another 5-10 seconds to avoid clumping. Please leave a comment below and share your thoughts on the The Healthiest Smoothie Ever. Happy Blending! I will surely try this recipe! Awesome, I hope you enjoy it! I make something similar to this every week and it never ceases to leave me feeling great and full of energy. brought some lovely coconut oil today. just wondering, how do you put it in a smoothie? do you just dig out a tablespoon and put it in or do you melt it over a double boiler then pour it into the smoothie when blending? The consistency of the coconut oil I use in my smoothies depends on the time of year because the melting point of coconut oil is about 76 degrees. The coconut oil I used today was solid, which is actually how I prefer it – easier to work with. I’ve found that in liquid form with frozen fruit or ice coconut oil doesn’t always blend completely, and it’s harder to measure and kind of messy. Thanks for the kind words on my site – it’s been a lot of fun sharing what I’ve learned with others. Thanks for the kind words. I’m equally as thrilled that you found my site and are enjoying the content! Cheers! Wow, my best co-worker and BFF Beatty, sent me a link to your site, in my recent weeks of researching your website is the best EVER. I am a few weeks new to making Smoothies for better health for myself I’m 52 and for my hubby he’s 44 and undergoing dialysis and chemo treatments. Thank you for a FAB site on improving one’s overall health. Great to hear you’re successfully making healthy smoothies. Good luck to you and your husband. I’m so glad I found your website! Here in brazil people are starting to go deep in the super foods, besides açaí of course! It is great to have new recipes and to get all the information you provide here. Here is my question: can we add citric fruits to the smoothies with spirulina!? I havent seen a recipe with it, so I was wondering if there is a problem with that. I always make a juice with mineral water, kale and limes, and I would like to add spirulina to it, if possible! Thanks for sharing all your knowledge!!! There isn’t a lot of hard evidence behind it, but apparently citrus fruit may counteract the beneficial alkalising effects of spirulina (and chlorella). Mixing the two once in a while is no big deal, but I wouldn’t regularly. Hi Ryan, I’ve started using smoothies today as I have started a diet I used watermelon, mango, 1/2 banana, kiwi, pineapple, cup of water, Chia seeds, cayenne pepper and coconut oil. Is this any good once a day for helping to loose weight and can u maybe give me an idea for a smoothie that I can use once a day to help aid my diet please. Thanks Vikki. That smoothie isn’t terrible, but is a little high in sugar. Please see the recipes above for weight loss. Awesome smoothie! Thanks for sharing! Would you recommend adding blueberry extract? Great to hear you liked this smoothie, Matt. I recommend adding blueberries.